Your contract lifecycle process need a boost but can’t figure out where to get started? Sure, you have your feature wishlist for automating contract management, and probably a budget too, but with a plethora of options, the last thing you want to do is bite more that what you could chew. While on the surface the challenges look similar, every organization and the teams within can have difference in priorities and how they approach contracts management as a process. The key to successful implementation is getting your stakeholders and fellow employees on board by generating a few “quick wins”. Working with hundreds of contract management and legal teams around the globe, some of these which you could expect as part of your contract automation with eContracts, Office 365 and SharePoint are highlighted below. This article is aimed at anyone whose contract management process consists of nothing more than email conversations, spreadsheets and documents stashed across shared drives, file cabinets or some document software. eContracts inbuilt business areas, SharePoint based document repositories along with Active Directory integrations enables creation of hierarchical access levels and user permission. Providing or denying access for specific sensitive contract records, or temporary sharing to external guest users is achieved with a single click which automatically resets access control for all folders and document documents, sub-agreements, obligations and reporting views. With eContracts, it’s easier than ever to manage deadlines. Notifications sent via email remind users of upcoming expirations and obligations such as payments that are due. Reminders can be automatically created, assigned to appropriate business users and status updated even from email. Contract owners are notified of changes made to contracts documents, metadata and status updates. Scheduling contract reminders, task alerts and escalations can save hours spent on sending emails and making calls for status updates. Even ‘simple’ deals can involve dozens of documents and several individuals needing to review and provide feedback. Automating the review process with workflows eliminates manual tracking of versions, email reminders, reassignments and waiting time in case of unavailability, and security concerns. Open communication and visibility in what other reviewers are changing, status updates in real time immediately improves contract turnaround time and business satisfaction. Certain types of contracts, depending on jurisdiction or types of counterparties require the final agreements to be signed in a specific order by authorized personnel to be executed. Identifying authorized signatories, their availability and keeping track of signature user and timestamp causes delays and administrative bottlenecks. Automating the signature process along with eSignature capabilities allows for identifying authorized signatories, including signature blocks in documents and obtaining real-time updates and in turn shortens processing time. This is also a great way to engage management users in the software. Got legacy contracts? eContracts with built with Optical Character Recognition (OCR) and algorithms that discern key contractual information not only makes them searchable but can simply process them into full fledged contract records. This means that information such as important dates, counterparties, obligations, related sub-agreements, terms and clauses are metadata tagged to the record which can be utilized for alerts, metrics and reporting. Contract digitization and workflows are great for operationalizing and streamlining your contract process. In addition, a well defined set of reports that includes business critical metadata and views can provide stakeholders insights that drive decisions. For example, cycle time reports show delays at each stage indicating potential bottlenecks in the approval cycle. Process owners can rethink the approval process or maybe skip approvals stages using threshold limit rules say, routing only high value for budget approval. Does your contract team spend time getting business users up to speed? Business user interface enables self service contract creation, search and collaboration. Authoring contracts from pre-approved templates and business specific forms to capture information from users to create contract documents in minutes. Weather it is within the departments or with external legal teams, fostering collaboration with business teams in the contract management process drives speedy and effective decision-making. 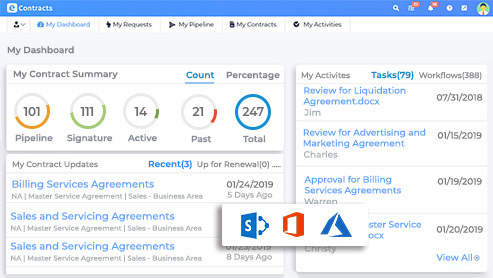 Powered by the Microsoft Cloud, eContracts is a Contract Lifecycle Management software specifically built for organizations using Office 365 and SharePoint.